Dr. Vanessa Fritz grew up in several Latin American countries, exposing her to various healing traditions and teaching her to be curious and open-minded. 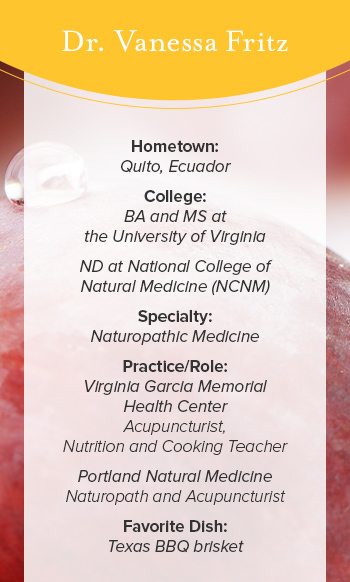 As the only licensed Acupuncturist at Virginia Garcia Memorial Health Center, Dr. Fritz considers herself fortunate to work with a variety of different medical providers to deliver healthcare to a diverse patient population. During her time off, Dr. Fritz enjoys spending time outdoors in Oregon, as well as cooking with whole foods. She enjoys the challenge of improving recipes by making them healthier AND tastier. Question: How did growing up all around Latin America curate your current medical approach? Dr. Fritz: Even though all the various countries I lived in were Spanish-speaking, every country was different. As a child, I'd get used to the way people did things in one country, but when we got to the next country, I had to re-learn how to be, act, and speak the new vernacular, even when I thought it strange. I think this helped me widen my view of medicine and healing, and opened my mind to the naturopathic approach, which so eloquently combines science with tradition. What inspired your passion for naturopathy? Learning about culinary herbs piqued my curiosity. That led me to start going to herbal conferences, where I heard a naturopath deliver an amazing lecture. I then realized there was a field of medicine that taught science while also embracing the knowledge of so many traditions. I was happy to find a world that made so much sense to me, and was eager to learn as much as possible. Can you tell me about the origin of the clinic you work in? Virginia Garcia was a daughter of two migrant farm workers. She got a simple wound that became infected. Out working in the field all day, her parents didn’t have the means to take their daughter to a doctor. The little girl ended up dying from a very preventable cause. People were up in arms over this and the clinic was started the very next day in a barn in Cornelius, Oregon. Now Virginia Garcia Memorial Health Center has several clinics in Washington and Yamhill counties in Oregon. It has grown with the mission to "provide care to those who need it the most." How do you navigate the different modalities and professions in the center? I am part of a team of many different providers that are available to our patients. I think we are all glad we have each other to help out. I would get way too stressed out if I had to take care of these very medically complicated patients on my own, so I am glad I am working with other experienced providers. In turn, the primary care providers are grateful to have diabetes educators, clinical pharmacists, mental health specialists, naturopaths, and an acupuncturist to whom to refer their patients for further care. The patients are grateful as well to have access to a naturopath and acupuncturist that can address their health from a more functional approach. Let's take an example. Right now, the pendulum is swinging away from the use of opiates for chronic pain management, and rightly so. We need to have something else to offer these patients. Acupuncture is a great option for alternative pain management strategies. Along with diet and lifestyle modifications, this empowers patients to start taking control of their own health, and not to just expect someone in a lab coat to administer a pill or injection to "make it go away." Many of my patients eagerly come see me as they hear acupuncture can be helpful for this or that. Sometimes, though, I get patients who come as part of a treatment plan dictated by their primary, and they aren't necessarily thrilled. The best part is when these patients walk out feeling better and say, "Wow, I didn't think this would work!" It's fun to convert the skeptics, and it is rewarding to have them come back and start becoming active participants in their own care. Tell us about the new wellness center at Virginia Garcia. The wellness center was conceived as an integral part to the clinic when it was rebuilt a few years ago. Most people in the United States aren't eating right, exercising regularly, or drinking enough water. The wellness center amenities include a teaching kitchen, large exercise room, organic vegetable and herb garden, and offers many types of classes to take advantage of all this. Having affordable exercise and nutrition classes available on site helps to reduce the patient’s obstacles to a healthier lifestyle. It's wonderful to work in a truly integrative setting, where we have the means to incorporate some of the basics—food, exercise, and community—into the treatment plan.